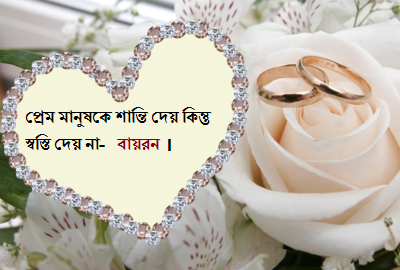 With the best bengali love quotes you can get some romantic moment from your lover. There is so many bengali quotes in many books and novels, but there is so small amout of bengali love quotes you will get. 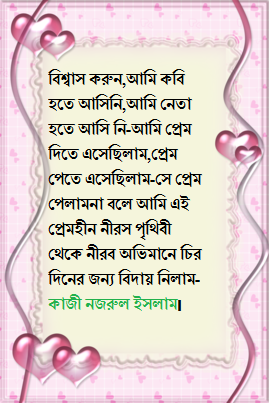 So here i have collected some good and romantic bengali love quotes for all you. These quotes are collected from many sources and books. So you can read and share it confidently. All of these quotes are high qualified so you can send it to any person of your life. If we share these bengali love quotes with our best friends or lover then they will be more happy surly. Jibone valobasa asar purbe hajar bochor eka thaka jay, kintu valobasar por ek muhurto O eka thaka jay na. ar valoasar manushti kichu somoyer jonno kache na thekle mon ta kemon bekul hoye thake take kace pabar jonno, hoyto ba etai valobasa. kauke abeger valobasa dio na moner valobasa dio, karon abeger valobasa ek din bibeker kache here jabe R moner valobasa chiro din theke zabe. ami bolte chai, bolte pari nai. ami zanate chai, janate pari nai. ami bujhate chai, bujhate pari nai, aj somoy eseche tai bolchi. tumi amar basay murgi churi korte keno giyechile ? uttor dao ! prem tumi boroi kothin preme na porle bujha jay na. prem tumi boroi kothin preme na porle jibonke onuvob kora jay na. Tumi sei sopno chari jake niye sopno dekhi, tumi sei onuvuti jake amr mon onuvob kore. tumi sei premika jar valobasar chondo premik ami. hote pare mon thke dure tothafi royecho mor noyon pur a. hoyto tumi nei ai ridoy a tobuo royecho porosheri e vitore, karon valobashi sudhui tomare. chad tumi jemon ratke valobaso amio thik temni kore ek jon k valobasi, tomr valobasa jemon keu bujhe na, thik temni kore popi amr valobasa bujhe na. a nisthur prithibite sotti karer valobasa paowa boro day. sobai misti kotha bole mon vulate chay, ashole thake karo mone valobasa , sarther lagi kache ache mone onno asha, sartho uddhar hole mone dukkho diye kete pore. Shite chador joriye kuashar majhe dariye, hat duto dao bariye, shishirer shitol sporshe jodi, shihorito hoy mon, bujhe nio ami achi tomar pase sarakkhon. normal hater suit lekha, bondhu ami very eka, cader gaye josna makha, monta amr bhison faaka, faka monta puron koro, ektu amay soron koro. sundor se to sopno chaina molin hobe, jibon se to golpo likhina nosto hobe, mon se to mondir vengona pap hobe, valobasa se to sotto, vul bujona hariye jabe. joto durei hariye jao, ami tomake khuje ber korboi, jotoi por vabo amay, ami tomake apon kore neboi. jotoi ghrina koro amay, ami chiro din evabei tomake valobese jabo. jotoi pashan hok tmr mon, oi mone amr jonno valobasar ful futaboi. tmi sei kobita, ja proptidin vabi…. likhte parina, tmi sei chobi ja kolpona kori, …. akte pari na. tumi sei valobasa, ja protidin chai,…… kintu ta kokhonoi pai na. jibon karo jonno theme thake na, kintu monta majhe majhe theme jhay, prio manushtar jonno. 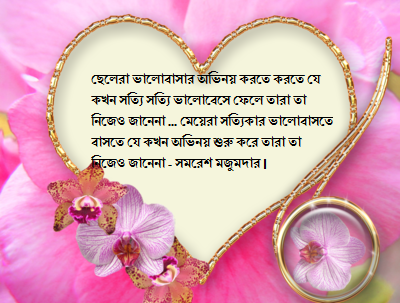 You should share bengali love quotes every day to live more lovely. If you send these quotes to your wife, she will be very glad to you. If you send these quotes to your girlfriend, she will get more defence on you. She will start believe to you. On the other hand, if you are a girl, then you can send this quotes to your husband or boyfriend. 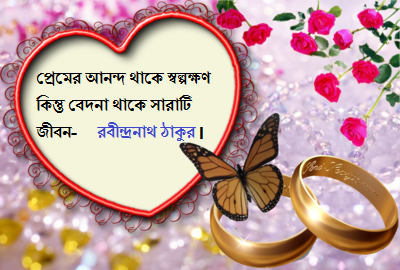 If you share reqularly bengali love quotes with your husband or boyfriend he will like more you. After all i want to say you, just make your life more romantic with your life partner and share bengali love quotes wiht each other. 2. Believe me, I did not come to be a poet, I did not come to be a leader-I came to give love, I came to love- I did not love this because I took this loveless silence from the earth and I went for a peaceful life forever – Kazi Nazrul Islam. There is a kind of weakness in someone to love heavily. Looks like you are a little bit shy and little. This thing cuts itself down – Humayun Ahmed. If you are not afraid of love, then the juice is not intensive – Rabindranath Tagore 7. Boys and girls can be friends, but they must fall in love with each other. Maybe for a very short time, or at the wrong time Or too late, or not for all time. But they will fall in love – Humayun Ahmed. The first shows never is love. That’s what is good. And it feels good. When you think about love, there is love. Love means attraction of heart, love means little huff, 1 hart of 2 birds, two arrows in one river, two minds 1 hope, its name love. I found you in search of life, I loved you when i am going to love me, I did not know what is defination of love, but you have taught me. I don,t know who you are … and why I call you, I wake you up and sit alone, you are my unseen dream, you are my fantasy princess. You loved me in a little bit, so I love you as like a crazy, the whole life i want to live with you. Keep in mind that wherever you are rescued, remember me all your life, wherever I live, I remember you all the time, my safe haven in your chest. Love flowers falling in the garden, love clouds of river, love flying zombie, and love your two eyes. I saw you in a foggy morning, covered your face with shameless hair, and I went crazy, May be You want to say in your eyes – I also love you. chokher kosto dekhe sobai chokhe jol eale?moner kosto keu dekhte pare na eakmatro aponjon na hole. যদি তুমি আমাকে ছাড়া ভালো থাকো তাহলে অভিযোগ কিসের? তোমাকে ভালো থাকতে দেখতে পারবো না তো ভালোবাসা কিসের?! 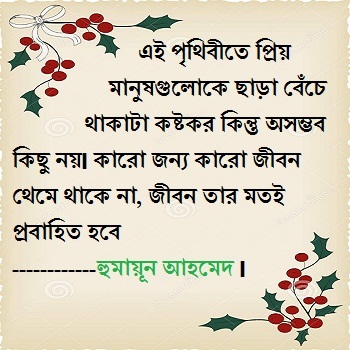 “তুম খুস হো তো সিকায়াত ক্যাছি..